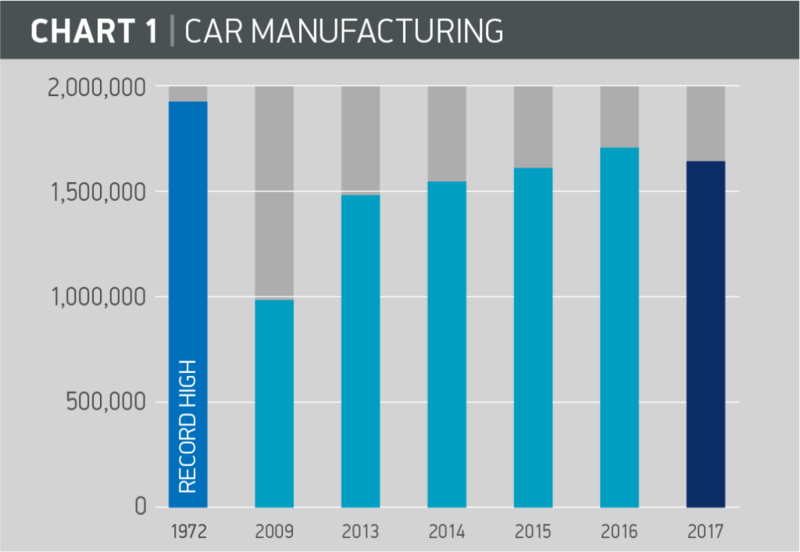 The success of the automotive industry in recent years is the result of hard work in the sector to balance economic growth and value creation while reducing resources and costs. This must be achieved while satisfying government’s ambitions as well as regulatory and customer requirements. In parallel with more traditional production processes, the industry has started gearing up for the digitalisation of production lines, which requires long-term investment. In 2017, the decline in production underscores the fragility of the balance previously achieved and the importance of government and industry working together to ensure the right conditions for the sector. The uncertainty that Brexit brings, needs to be off set by long-term policies and close cooperation with government to ensure a vibrant and growing automotive industry in the UK. UK car production declined by 3% in 2017, with 1,671,166 vehicles produced. While this was the first decline for eight years, it was still the second highest output since 2000. A 9.8% fall in output for the domestic market drove the overall decline as the market responded to declining business and economic confidence, as well as concern over uncertainty about the UK government’s policy on diesel. Exports also fell, although at a much lower rate, by -1.1%. Overseas demand continued to dominate production, accounting for 79.9% of all UK car output – the highest proportion for five years. The EU remained the UK’s biggest trading partner, taking more than half (53.9%) of exports, while appetite for British-built cars rose in several key markets, notably Japan (+25.4%), China (+19.7%), Canada (+19.5%) and the US, where demand increased by 7.0%. Commercial vehicle (CV) manufacturing declined 16.7% in 2017 with 78,219 vans, trucks, buses and coaches leaving production lines. Domestic demand fell to its lowest since 2009, down 25%, at 29,320 CVs. The decline reflected a fall in business confidence and fluctuating buying cycles. The number of CVs produced for overseas markets also fell, albeit by a slightly more modest 10.8%. However, exports accounted for 62.5% of overall UK production – up from 58.4% in 2016 – the largest proportion in eight years. The EU remains the UK’s largest export market, accounting for 94.1% of CVs produced for international markets. Demand for UK-built engines grew at home and overseas, with overall output up 6.9% to more than 2.7 million – with 54.7% destined for car and van plants around the rest of the world, the majority in the EU. The growth is the result of significant investment in plants now producing high-tech, low-emission petrol and diesel engines. In 2017, more than 1 million diesel and 1.7 million petrol units were built in Britain. Labour productivity is typically defined as real value added per hour worked. However, consistent and robust data series on working hours across automotive manufacturing mean that value added per job is the most available measure based on official sources. In terms of current prices, the gross value added per job was £86,000 at 2017; a value which has almost doubled over the decade. When adjusted for inflation, the real gross value added per job is £81,000, up a more modest 17% over the past 10 years. For the automotive manufacturing sector there has been real growth of about 1.6% per annum since 2007. Despite the drop in output, automotive manufacturing turnover increased by 5.3% to an estimated £82billion (SMMT estimate based on official data). This rise could be due to a shift to higher value products. SMMT estimates of value added were £20.2 billion. Signatories reported £77.7 billion in turnover (note: signatory activities go beyond manufacturing), representing an increase of 5.4% on the previous year.